Collection of fish recipes - Fish, prawns, clams and crabs are an essential item that Coastal side people use to prepare their staple food. Variety of dishes can be made with these main ingredients and each dish has its own taste and flavour. In that region fish dishes are made with coconut, chilli powder, ginger, garlic, coriander seeds, tamarind or amchur or kokum. 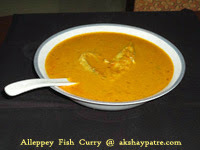 Alleppey fish curry - This is a delicious coconut milk based alleppey fish curry made with pomfrets. 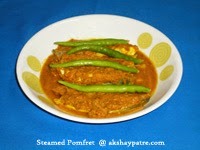 In the place of pomfret you can also use king fish, prawn, lady fish etc. 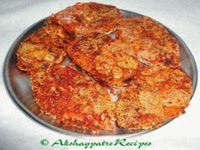 If you replace the pomfret with other fishes, change in quantity of chilly powder is necessary. As the fish changes, the taste of curry may change. In general, all fish curries goes well with steamed rice. Steamed pomfrets - In this dish, pomfrets are steamed along with thick masala paste prepared with ginger garlic, green chillies and cumin seeds as basic ingredients for the masala. You can also add fresh coriander leaves to make the paste more thick and flavourful. 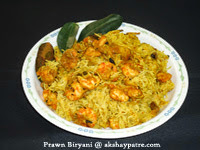 Prawn biryani - Prawn biryani is a speciality of Coastal Karnataka and this is our favorite biryani. It is very similar to the other biryani or pulav For non-vegetarians, this is a nice variation with prawns. 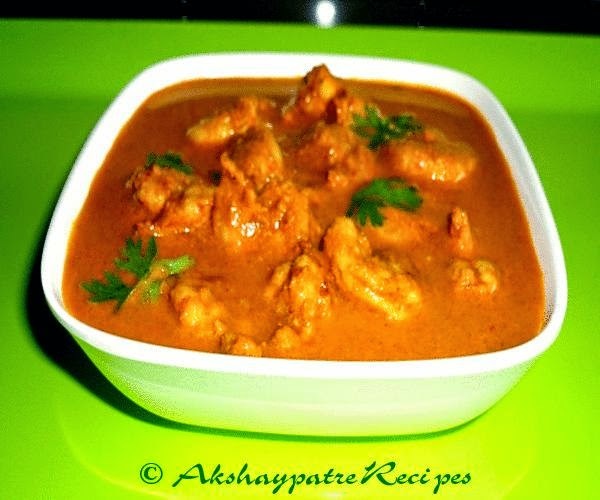 Usually, prawn biryani is prepared using small variety of white prawns. King Fish - Surmai (Iswan ) Fry - King fish is marinated with tangy and spicy masala paste, coated with semolina and then shallow fried on low flame. 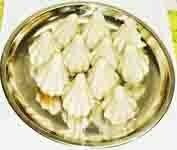 This is simply wonderful, delicious and goes well with hot steamed rice with curry, or curd rice. Pomfret fry with green masala - The green masala in this recipe is made using green chilies, coriander leaves, ginger, garlic and cumin seeds. The masala paste is very pungent and flavourful. 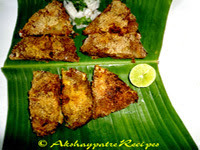 This very popular method of making fish fry with green masala. Also Check some other interesting fish recipes in this space.